Arsene Wenger says it is unfair. Michel Platini believes it is damaging. Harry Redknapp has even likened it to "gang warfare". But, like it or loathe it, the January transfer window has now been part and parcel of the football calendar for a decade. Fifa's insistence on limiting permanent moves during the season to a one-month period was grudgingly accepted by English football for the 2002-03 campaign. 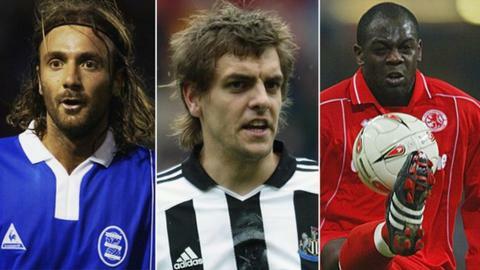 BBC Sport looks at the hits and misses from the first transfer window 10 years ago. What they said: "There has not been a better player ever to play for this club." Steve Bruce, then Birmingham manager. With a CV that included lifting the World Cup and European Championship, not to mention spells at AC Milan and Barcelona, eyebrows were raised when Dugarry swapped Bordeaux for newly-promoted Birmingham. While he failed to score in his first 10 games, Dugarry was the catalyst for a late-season surge that saw the relegation-threatened club comfortably beat the drop. Five goals in four games earned the French forward a permanent deal in May but he departed a year later. His family were unable to settle, and he struggled with a knee injury. Despite shining only briefly for the Blues, he is fondly remembered by fans, who chose him as one of the inaugural inductees to the club's Hall of Fame in 2010. What happened next: Dugarry retired after a brief spell in Qatar. He is now a respected pundit for French broadcaster Canal Plus. What they said: "I said to Alex Ferguson that I was trying to get Yakubu, and he said, 'Harry, hop in your car and get him now - he's electric." Harry Redknapp, then Portsmouth manager. Plenty of clubs were watching the Nigerian, who had netted five Champions League goals for Maccabi Haifa in the first half of the season, so Redknapp had to move quickly in order to bring him to Division One leaders Portsmouth. Promotion was duly achieved, with the 20-year-old contributing seven goals in 14 games. Pompey had to pay £4.2m to make the move permanent, but 'The Yak' soon proved his worth, and netted 113 league goals during his nine-year spell in England. What happened next: He played for Middlesbrough, Everton, Leicester and Blackburn before joining Guangzhou R&F following Rovers' relegation last year. He scored nine times in 14 games in his first season, and says he is enjoying life in China. What they said: "There is no such thing as the complete jigsaw in football, but for now he could be regarded as the last piece for us." Sir Bobby Robson, then Newcastle manager. Woodgate's departure provoked howls of protests from Leeds fans who had already seen Olivier Dacourt, Robbie Fowler and Lee Bowyer leave Elland Road in the January window. The deadline-day sale of Woodgate, a youth team graduate heralded as one of Leeds' "crown jewels", reinforced just how desperate the club were to balance the books. Injury problems meant he started only 28 of 51 Premier League games for Newcastle. But his form was still good enough to attract the attention of Real Madrid, and the Magpies made a healthy profit when they accepted a £13.4m offer from the Spanish club in 2004. Premier League clubs paid £925m in January transfer fees between 2003 and 2012. Just £35m was spent during the first window, compared to a record £225m in 2011. Analysis: Is it worth spending in January? A thigh injury meant he waited 13 months to make his Real debut - which ended in disaster after he scored an own goal and was sent off. Marca readers later voted him La Liga's worst signing of the 21st century. What happened next: After leaving the Bernabeu he had stints with Middlesbrough, Tottenham Hotspur and Stoke. He rejoined Middlesbrough for a second spell last summer. What they said: "In terms of bringing players in, Roberto is the last throw of the dice for us." Brian Flynn, then Swansea manager. Who knows where League Cup finalists Swansea would be today without Martinez. He was not strictly a window signing (Football League sides were initially exempt from transfer restrictions) but his arrival in January nonetheless proved a turning point for a Swansea side bottom of the league. Handed the captain's armband, Martinez's calming influence in midfield proved crucial. The Swans lost just five of their final 19 games and avoided relegation from the Football League courtesy of a final-day win against Hull. Martinez helped Swansea climb from the fourth tier to the Championship, taking over as manager in 2007 following a short spell away from the club. He was instrumental in introducing the patient passing game which has become the Swans' hallmark in recent years. What happened next: The Spaniard left the Liberty Stadium in 2009 to take over at another of his former clubs, Wigan. What they said: "The specialist said it is high risk because he hasn't played 90 minutes for Leeds [this season]. I knew that and it doesn't worry me." Kevin Keegan, then Manchester City manager. Fowler initially turned City down, but had a change of heart a fortnight later after Keegan paid him a personal visit, outlining his ambitions for the club. Only 14 months earlier Leeds had paid Liverpool £11m for the England international. But, with the Yorkshire club desperate for money, Keegan got his man for around half that price. The striker chipped in with 20 league goals in his three years at Eastlands, but City fans never quite saw the best of him. Increasingly injury-prone, he was allowed to rejoin Liverpool in 2006. What happened next: Fowler has been without a club since quitting as player-manager of Thai side Muangthong United in 2012. He is now focused on punditry and his property business. Remembered by many as the archetypal one-cap wonder, Ricketts moved to Middlesbrough on deadline day hoping to recapture the form that had earned him England recognition only a year earlier. The forward had managed just three league goals from open play since his 45-minute international cameo against the Dutch. The Teessiders beat off competition from Tottenham to sign the 24-year-old. But while he was part of the Boro side that beat Bolton in the League Cup final, he continued to find goals elusive. He departed in 2004, having scored only four times. What happened next: Ricketts played for nine lower league clubs in six years, but has been without a club since being released by Tranmere three years ago. What they said: "We were quoted £9m for Christie in the summer and when Ricketts played for England you were talking £10m - so these have been excellent deals." Steve McClaren, then Middlesbrough boss. Another deadline day signing for Boro, Christie joined along with Derby team-mate Chris Riggott. The striker had won 11 England Under-21 caps at Derby, and once scored the Rams' winner in a Premier League game at Old Trafford. However, his time at Boro was blighted by injuries, including two broken legs. What happened next: Released in 2007, he attempted a comeback with Leeds before retiring in 2009 because of a spinal injury. Last year he began a new career as a salesman at an Aston Martin dealership. What they said: "I certainly don't feel like I'm taking a gamble with Lee. I'm as confident as you can be that he will be a good signing." Glenn Roeder, then West Ham manager. Bowyer's Leeds contract was set to expire at the end of the season, so he was allowed to join his boyhood club for what appeared a bargain fee. He had nearly joined Liverpool for £9m the previous summer, but West Ham persuaded Leeds to accept a far smaller bid by offering a £1m bonus if the relegation-threatened Hammers beat the drop. However, Bowyer made little impact, failing to score in 10 appearances before missing the run-in through injury. 'I let my heart rule my head. I wasn't fit, so really I probably did no-one any favours," he later conceded. What happened next: Bowyer returned for a second spell at Upton Park in 2006. After being released by Ipswich last year he made an unsuccessful attempt to qualify for golf's Open Championship. Read more on January transfer window - is it worth spending money? How do you measure a player's character? Read more on How do you measure a player's character before signing them?